Are All Dogs “Good Dog” Candidates? They are if they have “Good Dog! Practical Answers to Behavior Questions” author and certified animal behaviorist Steve Dale in their corner! What questions would you ask Steve if you had a chance? Does your dog jump on everyone who comes to the door? Does he terrorize your boyfriend or destroy something every time you leave the house? Steve’s new e-book, “Good Dog”, is a treasure trove of answers to these and so many other questions. You may find your dog’s puzzling behavior is not, after all, uncommon, and can be readily adjusted. Admittedly, Steve can’t do much for a terrorized boyfriend, but he can help the dog. Steve’s books are always an easy read and one of his important messages is focus on the positive, hence “Good Dog.” Your best friend probably shouldn’t think his name is “no.” The behaviors your dog has developed really have nothing to do with wanting to upset you in some way, so when your dog decides he must now eliminate on the kitchen floor, don’t take it personally! Dogs do not reason the way humans do. And by the way, that is by far the number one problem people ask about for both dogs and cats – soiling in the house. “Good Dog” leads with expert answers peppered with humor and polished off with common sense. It’s the perfect gift for the holidays at only $2.99, or you can get the enhanced version with video for $5 at itunes, Barnes & Noble and of course Amazon. You can reach Steve at Steve Dale Pet World (first link above) on Facebook and at Chicago Now, his blog. This podcast is less of an interview than a conversation, and as such we chatted about some topical items of interest, but if you want to get straight to the book, hit the 14 minute 48 second mark. This entry was posted in Animal Welfare, Steve Dale, Training and Behavior and tagged dog behavior questions, Q&A dog behavior, Steve Dale, training and behavior on December 10, 2012 by Mary Haight. You are completely sure that they are not sending me a message...even when the 'present' is in the middle of the bed! We have had discussions about moving to the backyard, and I think she understands! I def need to read this LOL! 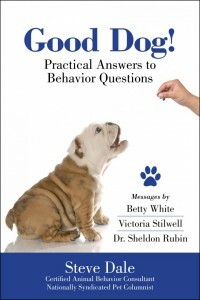 I haven't read this book, but we trained several of our dogs using the "good dog" method! I think the book was "Just Say Good Dog".